Ian and Joanna Kidman, 1965. In the opening sequence of the cult classic, The Great Silence, the cowboy — a lone figure on a horse — rides through the snow. The man’s name is Silence and he is the mute hero of the story, hunting down the villains who are tormenting the desperate townsfolk of a place called Snowfall, shortly before the Great Blizzard of 1899. He does not utter a single word throughout the film. In the end, everyone dies. film, the other elements of the plot don’t matter much. 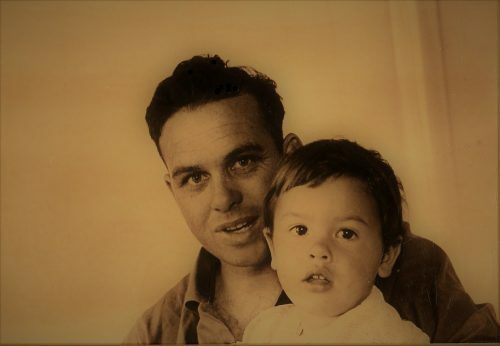 Because this is a story about my father and a generation of men and women who spoke — and then didn’t speak — te reo Māori. My earliest recollections of my father involve the memory of snow — family holidays on the slopes of Mt Ruapehu, or crunching ice underfoot on cold Rotorua mornings when the frost was heavy on the ground. When I was very little, my father and I took a road trip to stay with relatives in the Manawatū. South of Tūrangi, the snow flurries turned to sleet, and by the time we reached the Desert Road, we were driving through a blizzard. At the tussocky foothills of the Kaimanawa Mountains, my father slowed the car to a crawl and peered intently through the windscreen as trucks in front of us skidded dangerously on the slick road. Then our car swerved, and for a moment I felt us spinning helplessly towards oncoming traffic. And then, just as suddenly, we were back on course. “Pretty bad weather out there,” he turned to me, smiling, and I knew that he would get us through. That was my first intimation that my father saw his job as one of protecting me and keeping me safe. And, also, that there was a part of him that belonged to me. This was something I simply accepted without question, with the imperious narcissism of small children who are loved by their parents. When he died last spring, the world seemed smaller and much less safe. I was less certain that lift doors would always open for me, that bad times would eventually pass, or that the hero, with a quicker draw, would always win the fight. But if I saw my father as a kind of cowboy hero, he was also a man of strange and sudden silences. His restless, troubled mother abandoned him in his infancy and he was raised in difficult circumstances by his grandmother, who he loved dearly. Like many Māori children of his era, he spoke both English and Māori fluently. But in the early 20th century, the English language jostled for ascendancy in the civic life of Aotearoa, and many, although not all, Māori voices were stilled. As the years passed, English came to dominate conversations in schools and newspapers, in parliament and the offices of government. Then, from the 1940s, many Māori families moved to towns and cities where English was mainly spoken. A thriving language needs to be spoken in the everyday life of a community, and as the twentieth century wore on, fewer Māori families living in urban centres had that option. Fluency among Māori children dropped from 90 percent in 1913 to 55 percent in 1950. By 1975, five percent were fluent. This was a dramatic shift in a very short period of time. For some, like my father, the cadences and rhythms of the language remained with him throughout his life — but, increasingly, they were locked away inside him. The reasons were complicated. But his was a particular quality of silence familiar to those Māori men and women who saw a rapid decrease in te reo Māori speakers in the space of a single generation. In his later years, Dad would start a conversation in Māori with my husband and me, but then he would stop suddenly and look away. And I knew the words had slipped from his grasp. This was not a matter of forgetfulness in old age. What happened to him was political. It’s what happens in places, like New Zealand, where systematic attempts are made to supplant one language with another. Last year, Dad heard of a study about the decline of te reo Māori among older speakers, and he thought he would like to be interviewed for it. He wanted to put his story on the record so people would understand that he was once a fluent speaker, but after years of disuse, the words wouldn’t come. He wanted to talk about the aching sense of loss when that part of a life lived on a King Country pā in 1930s New Zealand could not be spoken of, except in English, and that was not enough. I know that he hoped that these stories would be told after him. In the last year of his life, when he was 84, he enrolled in an online te reo Māori course to try and salvage what he had lost. That was his cowboy quest — to remember. And to learn to speak again. But the online learning environment didn’t work well for him, and the words remained stubbornly out of his reach. He wept when he told me this. Afterwards, I went home and wept, too. Recently, Mike Hosking suggested that people aren’t too bothered by the health of te reo Māori. And an Auckland academic, Paul Moon, has written that the decline in fluent speakers is caused by pronunciation “snobbery”. Moon’s ideas have caused heated debate during a slow summer, where the main topics of news have been the scorching temperatures and the prime minister’s pregnancy announcement. I’m not angry that he holds those views, but I don’t agree with him. Language shapes how we remember, but also how we talk about what we remember. It guides what we tell those who come after us. These are our stories. The words we use are important. I am fearful of what happens when any language passes out of existence. I worry that the shape of our world will contract, just as it contracted for my father when the words spoken in his childhood dried up through lack of use. What Paul Moon dismisses as pronunciation “dogma”, I see as a shoring up of courage against a terrible silence. My father’s death came suddenly. It took us by surprise. He had a fall. An accident at home. When people talk about elderly people having a fall, I think of something benign, like a Victorian lady in cambric petticoats fainting gracefully on the Axminster. Or taking a slow dive into soft furnishings. I think of smelling salts and great-aunts with lace handkerchiefs fluttering. Easily revived with a cup of tea, or a finger or two of gin. I don’t think of ambulances and hospitals or the paraphernalia of dying — of breathing tubes being removed or heart monitors switched off and wheeled away. Or at least, I didn’t, until that last, long night. I’ve heard it said that grief is a kind of madness. It makes one cry in supermarkets. It takes you unawares. In the weeks after my father died, I went about in public with a zombie-like smile plastered on my face. It gave me the appearance of dithery, unfocused battiness. It was a look that made a child start howling on the street. Another time, a dog barked at me over some fence palings. And I didn’t always answer when people spoke to me. I had no language for the grief I felt — and at times, I forgot how to converse. They could have been speaking Klingon for all I knew. I think this is what silence is like when language slips away. I think this is what my father felt. Since the funeral, the women in my family have been taking weekend drives out to Wellington’s Wāhine Park. The park is little more than a sloping, rocky outcrop that edges the sea. It overlooks Barrett Reef, where the Wāhine went down during the sudden, terrible storm of 1968, when so many lives were lost. We stand on the shore, my mother, my daughter and I, and watch the ferries inching their way around the treacherous rocks at the entrance to the harbour. We pick up smooth stones that are the exact shape of our palms. They are like my father’s hands, so warm. And we speak of him. Sometimes I fought with my father as I was growing up. We saw things differently. He didn’t always approve of my choices. But he was my person. My shield against the incoming storm. What happened to him as a bilingual Māori-speaking child, and then as a monolingual English-speaking adult, in the end, has given me my own vocabulary of refusal. It’s one that I use in the academic “gunfights” of the university where I work. If the English language is my legacy, then it’s a tool I have learned to use to good effect. So beware. I am armed with a determination to breach the white hush of the institution. It was my father, who never went to university, who taught me to speak to that particular silence. This past summer has been a roll call of “first times”. Christmas, New Year, grandchildren’s birthdays — for the first time, Dad hasn’t been there for any of them. I can still scarcely believe that I will not speak with him again. And yet, I see him still. When there are blizzards in the King Country and ice on the Desert Road — in my mind’s eye, that’s when I see my father turn and smile. That old cowboy, saddled up and riding on. Into that great silence.